Did you know that grow room ventilation is extremely important to your plants? Regular air flow is necessary to refresh the air with a new supply of CO2 while keeping lamps and plants cool in hot weather. Without proper ventilation, CO2 levels can become stagnant around plants and temperatures can rise quickly. In this post, we’ll take a closer look at why proper circulation is necessary, how to set up a ventilation system, and tips for ensuring your grow room stays cool during the hot summer months. Plants use the stomata, or pores, underneath their leaves to breathe both oxygen and CO2 depending on the day/night cycle. Over time these pores can get clogged by dirt, dust, or other air-borne particles. Usually, rain and wind wash and dry the leaves to keep them clean while moving fresh air around them, but in a greenhouse or grow room you have to replicate the effect using ventilation systems and sprays. You may be thinking, “Air is everywhere, this room isn’t hot so it’s fine.” But you’d be wrong. Plants are excellent CO2 scrubbers (absorbers that take in CO2 and remove it from the atmosphere). Their leaves greedily take in all of the CO2 around them and begin releasing excess oxygen (during the day). This rapid removal of CO2 is only replenished by moving air. Without circulation of the room’s internal atmosphere, plant growth can become stunted. It’s like trying to breathe after heavy exercise; the plants can’t take in enough CO2 for photosynthesis to occur properly. They can’t create the sugars they need and so development slows or halts. In some extreme cases, larger plants will even lose leaves. Proper air circulation keeps fresh CO2 moving past the leaves of the plants. Remember, you don’t need a strong wind, just a gentle breeze to replenish the air in the room. Circulating the air also allows you to control relative humidity. The heat inside a grow room can cause a large amount of moisture as condensation, especially when it’s colder outside, leaving your plants more vulnerable to pests and fungus. Your plants also give off (transpire) a lot of moisture that will build up in a room without air circulation. Replenishing fresher air and cycling out the moist air will prevent this buildup. On the other hand, cycling more humid air into a dry room can keep your plants from drying out in a reverse situation. For hot or cold grow rooms, you’ll find that ventilation is the primary method for controlling temperature. Whether you use natural (passive) or mechanical (powered) systems, you’ll gain access to adding or removing heat from your grow room. Extreme temperatures are damaging to plants and can inhibit growth or kill the plants. Every plant is different on what temperature it prefers (varying even by life-stage) so you’ll want to plan accordingly. How Do I Setup Green House Ventilation? The system you use for ventilation depends on where you’re growing your plants. For an outdoor greenhouse you can use a natural ventilation system. A sloped roof with exhaust vents at the top and intake vents at the base is the most common method. The alternative is a powered system using filters and fans. A powered system is almost always required for growing indoors, especially if you’re using a grow tent. You’ll find there are two common types of powered ventilation: IN/OUT and Controlled Environment Agriculture (CEA). This is the most common and inexpensive style of ventilation for greenhouses. IN/OUT ventilation uses traditional ductwork and inline fans to move air into and out of your grow room. These inline fans are powerful and have a design reminiscent of a jet engine (without the combustion). Speed controls give this type of fan extreme customizability in flow rate and temperature control for the room. IN/OUT fans require an exhaust fan mounted near the ceiling on one end of your grow room with vents or cracks near the floor on the opposite end. This exhaust fan pulls the air through the room and exhausts it elsewhere, usually outside. This system works even better when designed with two fans, an intake and an exhaust (with the intake pulling air into the greenhouse from outside in place of the regular ground floor vents). Be advised; it’s wise to include air filtration systems to keep outside pollen and other contaminants out of your greenhouse. IN/OUT systems also work effectively for closed lamp ventilation. When HID lamps are kept in enclosed fixtures, they can get extremely hot and require cooling beyond what the greenhouse requires. In such a situation, ductwork is connected directly to the light fixtures with a simple inline fan pulling air through the fixture and over the lamp to cool it. Remember: Always pull with fans, never push air into the room. Start with an exhaust fan that pulls air from the room, and then add an intake fan that pulls air in from outside. 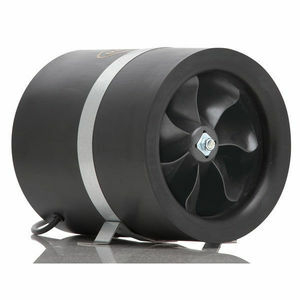 Inline fans are inexpensive and simple to set up, but they are also extremely noisy, even at the highest quality levels. Additionally, the larger the growing area, the more fans you will need to install which can lead to a very noisy work environment. And regardless of how much air you’re moving, hot air from outside will still be hot when you bring it inside. CEA systems use air conditioning (A/C) systems for accurate temperature control. With a CEA system, you can maintain a completely sealed room, preventing outside pollen and contaminants completely. When setting up an A/C system for your CEA, it’s best to install an automatic control unit along with a few fans for air-flow. Automatic controls give you the ability to maximize the growth of your plants through differential control as well. When you are working with a sealed room, you’ll want to add in some method of carbon dioxide enrichment, a humidifier, and an air purification and filtration system to ensure that nothing from outside makes it into your grow room. The size of your A/C unit will depend on the size of your grow room. If you’re unsure of what size you need, it’s best to check with the retailer first. Always get a unit that’s designed for a space larger than what you currently have, as it’s better to run a bigger system part of the time than to overtax a smaller system by having it run constantly. A constant soft breeze is never bad; it mixes the air, replenishes CO2, and helps to regulate temperature. Moving air also helps to discourage flying insects by making it difficult for them to move about the room. Either of these systems will accomplish this task, but you could also mix the two together, using the A/C system to cool the room, while inline fans and ductwork control the air flow and direction around the room. With the sizzling hot month of August looming ahead and the summer heat adding up, the dangers of excess heat from lighting and improper ventilation in your grow room can become extremely dangerous to your plants. But can you actually do anything about the annual heat wave? Take a look below for some helpful tips on how to stay frosty and keep your plants cool. Avoid twisting ventilation ducts. On average, the loss of air movement in a single 90-degree turn is equivalent to the loss over 20 feet of ducting. Place your air intake at ground floor on one side of the room, and the exhaust fans near the ceiling at the other end. This improves circulation into the room and pulls the cooler ground air into the room while the hotter air rises and escapes through the top. The goal is to replace all of the hot air with cool air (as a bonus you replace the stale air with fresh air). If things are still too hot, you can always try air conditioning the room; though this has a tendency to dry out the room. You can also cool the air in the room your intake is pulling from to indirectly cool your grow room. Pro Tip: You want to be able to completely replace the air in your room within five minutes. To do that you’ll need to know what kind of fans you need. Multiply the length of the room by its width and height (in feet) then divide by five (minutes) to see how many CFM of air (how much air can be moved by the fan in cubic feet per minute) you’ll need. As an example: A 10x10x10 room would be 1000 cubic feet. To clear the air you will need a CFM rating of at least 200 to replenish all of the air in five minutes. Since you always want to account for filters and turns; a 500-CFM fan would guarantee total air circulation in less than 5 minutes. Let’s assume you have the perfect ventilation system for your plants and the room is still too hot. Obviously, the largest source of heat in a grow room comes from lighting. 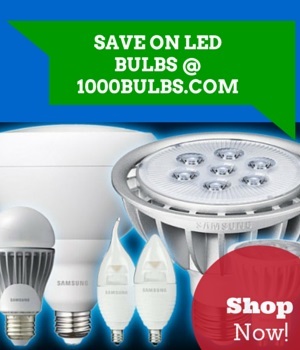 So, if you live in a constantly hot climate the best thing would be to switch to LED or fluorescent grow lights. They release very little heat and technological advancements have made them pretty much equal to HPS and MH lamps. But if you’d rather save on the upfront cost there are a few other methods you can use. Run your lights at night. Everything is cooler at night so it becomes much easier to maintain cool temperatures. For this you’ll want a timer to make sure your plants still get the right amount of light each night. Use fan and temperature controllers. Temperature sensors and controllers can be used to turn on extra fans or shut off lamps completely when the internal temperature of the room rises above tolerance. Use a dimming ballast. While this will decrease the overall amount of light in the room, a dimmable grow lamp means you can control its heat output without completely shutting off the lamps. Air-cool the lamps. Directly cool your lamps with a separate ventilation system. Use a sealed hood for your lighting and run additional ducting to directly cool the lamps (as a bonus, place dry ice above your lamps to help cool them and add CO2 to your grow room). Now that you are familiar with how to set up and improve your grow room ventilation, you should have no problems beating the heat. Remember, improper ventilation and the heat from lighting are the biggest problems when it comes to excess heat. For your plants you’ll find that better fans, newer lamps, and a few climate control tips can give a refreshing break to the summer heat. For you, you’ll want a tall glass of lemonade while you’re working. We’re based in Texas so we’re no strangers to hot days. But what do you do to keep your plants cool (or even just stay refreshed yourself) throughout the year? Does it even get hot enough to worry about? Share your ventilation tips in the comments below or give us a shout on Facebook, Twitter, LinkedIn, or Pinterest! Original post by Will Parsons. Additional information added by Angela Rogers. Most recent update on 4/9/2019.